1) Contact the pregnancy center/diaper bank and tell them your group wants to host a Baby Shower to collect items to donate. Obtain a letterhead from them to write a request to the store to do a donation drive. 2) Visit a local superstore several weeks or months ahead of time to get permission to host a donation drive on a specific weekend. Make sure you have the letterhead. Have information about the pregnancy center/diaper bank available. 3) Once permission is obtained, the fun part begins! 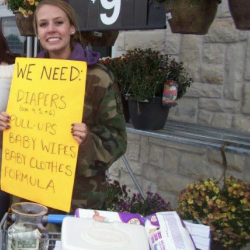 Make signs that say “We need: diapers, baby formula, wipes, etc.” and “All donations go to (name of pregnancy resource center/diaper bank).” Have a decorated jar ready for people to make cash donations. 4) Confirm the date of the Baby Shower with the store the week beforehand. Create a schedule of volunteers to ensure at least two people are manning tables at all times. - Be friendly and courteous at all times, whether requesting permission from a manager or customers entering the store. - Never leave money or material donations unattended. If you must leave momentarily, make sure a group member is there. - Only hand customers fliers/pamphlets if they request them, otherwise they might litter the store with them. - You will encounter all different kinds of people from all different backgrounds and lifestyles. Always be kind. - Thank the store for letting you host a donation drive! Make a phone call to the store, write a thank you letter or even write to the newspaper to publicly thank them. 1) Visit your church office and obtain permission to do a Baby Shower donation drive. 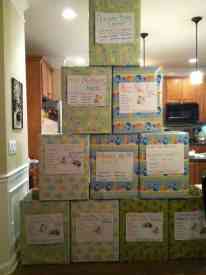 2) Once permission is obtained, decorate several boxes or playpens to leave at the local churches. If possible, have announcements made after each church service that a box will be left in the church office (for a few weekends or more) so parishioners will bring their new or gently used baby items. 3) The weekend of National Community Baby Shower Day, collect all boxes/playpens from all churches and donate items to the pregnancy center that your group is benefitting. Left: a pro-life group's stack of boxes full of items collected during church donation drives during the National Community Baby Shower Day weekend. 2) Begin searching for new or gently used baby items for sale and nearby yard sales with baby items. Make sure you search only within your area so you don't have to travel far, and always make transactions and trades in pairs. Never meet up with a stranger or go to a yard sale alone!! 3) Once all funds raised are spent, clean and wash all items and bring them to your local PRC! 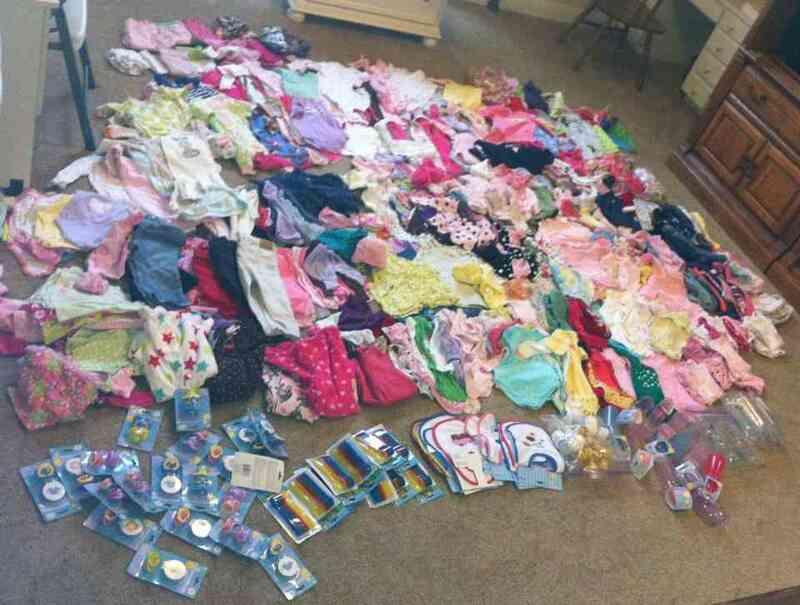 Above: with $100, just one pro-life person was able to gather over 500 baby items from Craigslist in a matter of days.